A female professor has become the first woman to lead a mixed congregation in Islamic prayer in Britain. American Amina Wadud arrived in Oxford to give the Friday sermon. 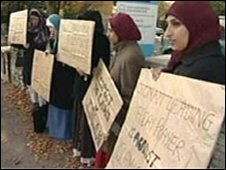 The move has angered many Muslims and a small group of protesters gathered outside Wolfson College to voice their opposition. Professor Wadud took the service - or khutbah - to mark the start of a conference on Islam and feminism at the college. It is Islamic tradition that imams, who are always men, hold mixed services. But the Muslim Educational Centre of Oxford (MECO), which invited Professor Wadud to lead the prayers, described the event as a "leap forward for theological destiny". "There's nothing in the Koran that prohibits it," she said. "My own theological research into the essence of Islam indicates the necessity for us to be able to move away from the tradition that restricted women from the practice of leading prayer." "This is not my norm," she added. "My norm is to pray and then cook dinner or something." One protester said having a woman leading prayers in this way was "against Islam". "We're here to uphold the traditions and the values of Islam and uphold the ways of the prophet - peace be upon him," said Aishah Samah, a protester from Oxford. Another Muslim woman, Maryan Ramzy, said: "We have no objections to women being heads of state, or organisation leaders. "Women are highly-respected in Islam. But in Islamic law, women cannot lead prayer." The protestors had ignored a plea from a local Muslim leader not to picket the mosque as it would give the event more publicity. "I urge the local Muslim people not to protest," said Sabir Hussain Mirza, the chairman of the Muslim Council of Oxford. The council said it represented 98% of Muslims in Oxford and opposed women leading mixed prayers. However, Mr Mirza said that the event was "nothing to do with us". In March 2005, Professor Wadud held Friday prayers to a mixed congregation in New York. Protests were also held on that occasion.